PHOENIX, Arizona, July 27. 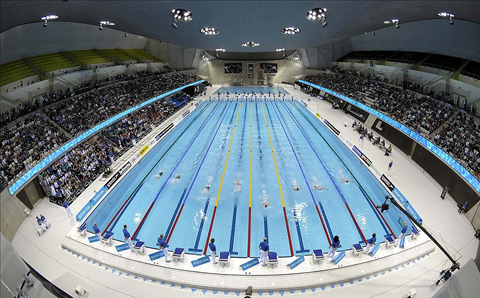 TOMORROW morning, the world will be watching the action unfold at the London Aquatics Centre at the Olympic Games, and the facility is ready to handle the hordes of swimmers, coaches and fans that will flock to the venue. It will continue a legacy of great venues that have hosted swimming events at the Olympic Games. Our final installment in this series looking back at all the Olympic pools in history, starting with 1908, concludes with the three most recent facilities built for the Olympics. These three ushered in the 21st century with style, creating venues that have dropped some jaws and left the world impressed with the results. We start with the 2000 Olympics in Sydney, Australia. With the way swimming is highly regarded Down Under, and with the immense talent waiting to collect gold for the Aussies in their home country, the Sydney organizers made a grand plan for the pool and came through with flying colors. The Sydney International Aquatic Centre, on the surface, didn't offer anything groundbreaking in its design, but it gave this swimming-crazy country a pool they could finally love. The spectator capacity was second only to the pools in 1936 and 1960 in terms of numbers. During the Olympics, 17,000 fans packed the seats to watch Ian Thorpe and the like tear through the water. Constructed in the Sydney Olympic Park, about a 30-minute train ride from the city's downtown area, the facility was not built specifically for the Games. Construction started in 1992, about two years before Sydney was awarded the bid for the Olympics, and was open for business in 1994 as a public pool that featured the 50-meter pool and a separate recreation area with wading pool and water slides. A $33.7 million upgrade added a lot more seating — about 13,000 seats — and renovated the competition pool with a state-of-the-art scoreboard. 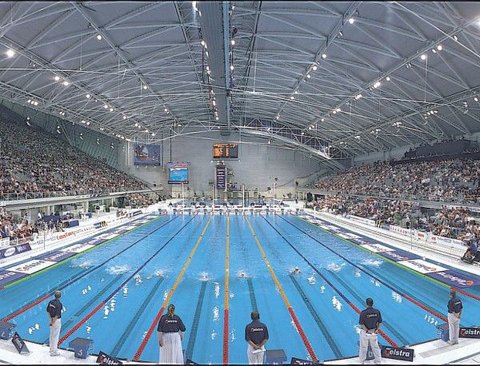 It became Australia's first major indoor swimming arena. 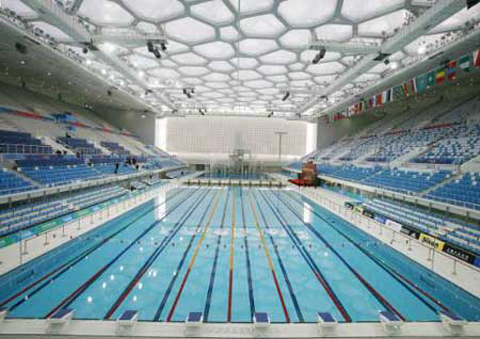 Besides the removal of temporary seating, the pool changed very, very little after the Olympics. The only major change was its name, to the Sydney Olympic Park Aquatic Centre. The pool was the site of every major national and international competition in Australia (except the 2007 world championships) until this year, when Australia hosted the Olympic Trials in Adelaide. The 2004 Olympics were plagued with problems before the Opening Ceremony. 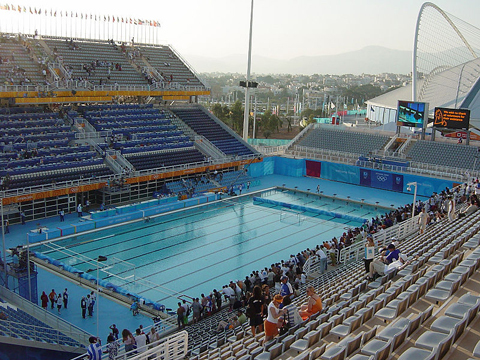 The International Olympic Committee was concerned that Greece could not pull off the Olympics, as many venues were in danger of not being completed in time. The swimming venue was one of those facilities. Like the Sydney pool, the Athens competition pool was not built for the Games. It had been around for more than a decade, hosting the 1991 Mediterranean Games. But the heat was a concern, and organizers had planned to put a roof on the building as part of the renovation plans. Money fell through, and the roof was not built, much to the initial chagrin of FINA, which would later approve the facility mere weeks before Michael Phelps and others claimed gold. Unlike many countries before it, Greece did not have much interest in creating a legacy for its Olympic venues. Many of the facilities are covered in graffiti and have homeless people squatting in them — at least until the police boot them out. The swimming pool is still in use, but very few people visit it. The iconic image of the Water Cube is likely still fresh in everyone's minds, since the Beijing Olympics were just four years ago. 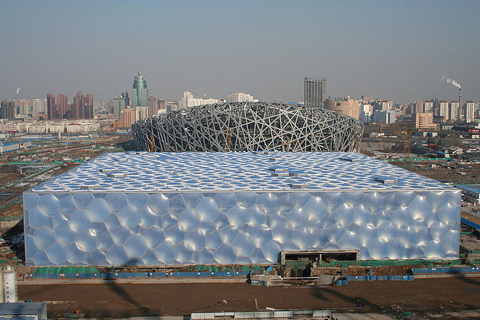 One of the most marvelous buildings ever to envelope an Olympic pool, the $156 million pool featured a steel structure covered in specialized plastic measuring 2 millimeters thick that resembles the bubbles of a pool. These days, the main competition pool and diving well still exist in their original forms. 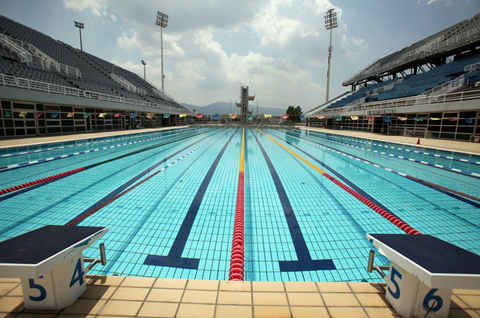 The pool hosted the FINA World Cup recently, as well as a few Chinese competitions. In an attempt to bring a continuous flow of money into the Water Cube, half of the building was converted to a water park, featuring water slides and zero-depth pools. The conversion meant the building needed to be closed for about two years and cost $31 million. The London Aquatics Centre has some big shoes to fill after the Water Cube, and is doing so nicely. Nicknamed “The Stingray,” the pool features a wavelike roof and “wings” that make the outside look like a stingray. Inside, the pool is nearly identical to that of the Water Cube. The starting blocks feature lights that signify the top three finishers in each heat. Send feature story ideas to Jeff Commings at jeffc@swimmingworldmagazine.com.